Marouane Fellaini, always up-front for Everton, never for Belgium. 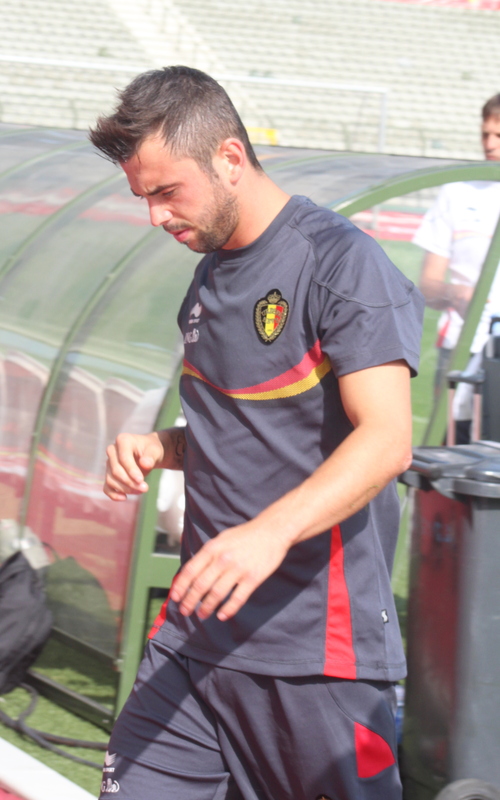 Back in September, I wrote a piece on the blog that looked at Marc Wilmots’ embarrassment of riches in midfield. I reasoned that he had eight candidates for the five places – for argument’s sake let’s assume that the Belgian team lines up in a 4-5-1 formation. At the time I wrote that “De Bruyne has probably not done enough to warrant selection yet.” That was then and this is now; this season, Kevin De Bruyne has only missed four minutes of playing time for Werder Bremen and Wilmots selected the ex-Genk man for the tough qualifier in Belgrade. Since then, De Bruyne has started every game for Belgium and is looking like the genuine no. 10 that he has promised to be. It’s time then to look at the midfield candidates ahead of the double header with Macedonia in March. In September, I listed eight possible contenders for the midfield births, although it could have been nine with Twente’s Nacer Chadli. The eight were: Steven Defour, Moussa Dembélé, De Bruyne, Marouane Fellaini, Eden Hazard, Dries Mertens, Kevin Mirallas and Axel Witsel. Let’s add Chadli into the mix as he has shown good form despite injuries. He mainly plays on the wing for Twente but I have a sneaking suspicion that Wilmots sees him more as a central player, rather in the Dembélé mould. Of the nine, Witsel will always be in the team. After the Slovakia game, Wilmots said that the Zenit St Petersburg man would be vital in the two games with Macedonia. Together with Vincent Kompany, Witsel – sitting in front of the back four – will always be selected for Belgium, if available and fit. Chelsea’s elder Hazard has not quite reached that status yet, but it’s hard to see Belgium lining up in a World Cup qualifier without him. Against Slovakia, Hazard had probably his best game for Belgium; it’s likely the enforced rest has been good for the boy. Of the remaining seven, three have not made enough of a case to be included in the starting line-up. Defour is not always in the Porto eleven and being seen as a candidate to play in front of the back four these days, he’s a long way behind Witsel in the pecking order. Injuries could have taken their toll and the days when Sir Alex Ferguson was sending him ‘get well soon’ cards are long gone. Chadli has also suffered from injuries but if he returns fully fit – and gets his desired move to the Premier League – he could force his way into contention. At the moment, he’s a squad player at best. Finally, there is PSV’s Dries Mertens. A speedy winger with an eye for goal and the ability to cross a ball accurately, Wilmots seems to regard him as a super-sub. That’s a tough tag to get rid of once it’s been awarded to a player. There has been talk that he gets most of his goals against the weaker teams and when Belgium played Croatia in Brussels, Stimic said they knew what Mertens would do and he did it. He’s another player who could end up in the Premier League and he may try to engineer a move before the 2014 World Cup. That leaves four players (De Bruyne, Dembele, Fellaini and Mirallas) for the three remaining midfield places. Assuming that Wilmots would want someone on the right flank, Mirallas looks like getting the nod. I have never been a big fan of the Everton winger, mainly because I saw him operating several times as a central striker for Belgium and he always disappointed. He’s done well in the Premier League though and if he can keep clear of injury, the place would seem to be his to lose. Certainly he looked useful against Slovakia and perhaps the main threat to him could be Anderlecht’s 19-year-old winger Massimo Bruno. The youngster looked the real deal when he played the second half for Belgium’s U21s against Spain in mid-week. Bruno looks fast, strong and is – of course – fearless. Fellaini has never played in an advanced role for Belgium, where he excelled against Manchester United in the opening game of the season and has done on many occasions since. Another ex-Belgium boss Hugo Broos has recently gone on record as saying that Belgium play better football without Fellaini in the team. It’s true that if Wilmots used Fellaini in his Everton role – which the player has said he does not like – then that would change the team’s whole dynamic. If he’s used as a box-to-box midfielder, that would have to be at the expense of De Bruyne or Dembélé; for me that would weaken the team. I would go with a midfield of Witsel, De Bruyne and Dembélé, with Mirallas and Hazard on the flanks. 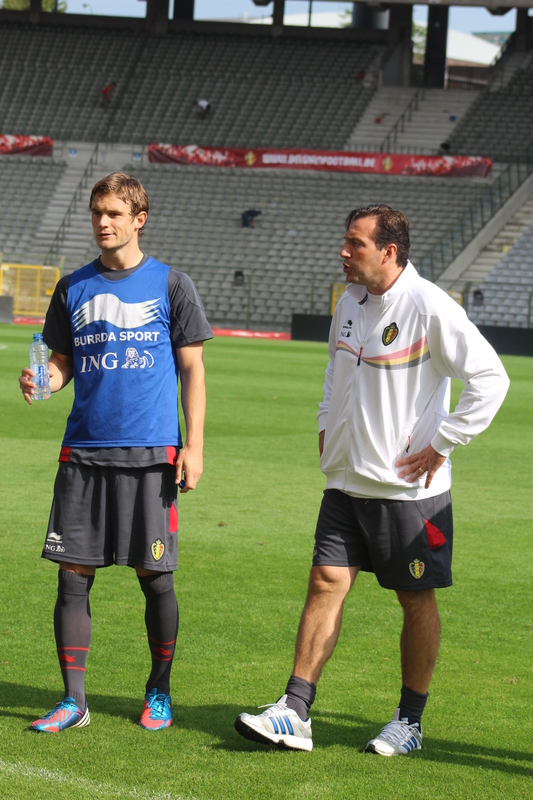 Wilmots of course would have the luxury of having some excellent alternatives on the bench. That’s the team I would put out against Macedonia and, in the event of qualification, in Brazil for the opening game. 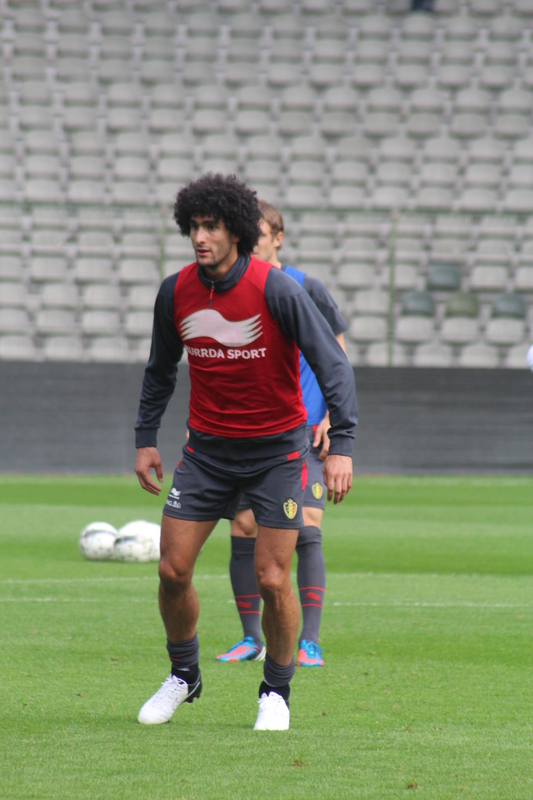 There’s a long way to go of course and Wilmots might want to use Fellaini for September’s clash in Zagreb. He’d be useful there as the physical side of his game is important. I feel Fellaini will have to settle for that kind of deployment and I don’t see him as a permanent fixture in the side, given his current role at Everton and the competition in the Belgium team. I don’t know if that’s superb irony/humour from your good self John but I love the caption “embarrassment of riches” with Guillaume Gillet in the photo! The point on Witsel is very well made. For me, he is the metronome of the team, the player who keeps the midfield ticking over and in many ways a barometer for the side. He was in total command in the first half v Slovakia and once Nainggolan came on, I felt Belgium lost some authority in the middle – though this can also be attributed to De Bruyne moving from 10 to the flank. You’re right, you have to love Guillaume. 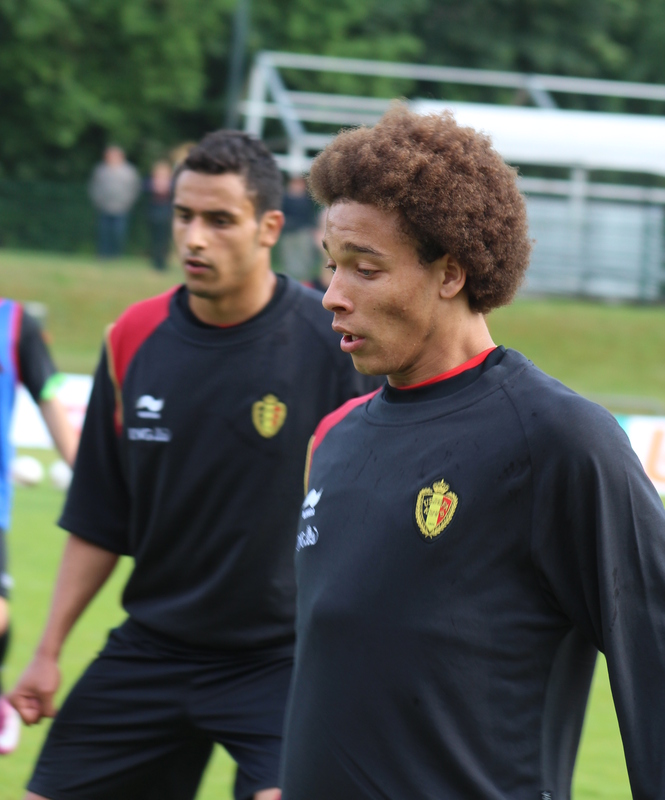 Good points re Witsel and De Bruyme, they are going to be the heart and soul of the team.